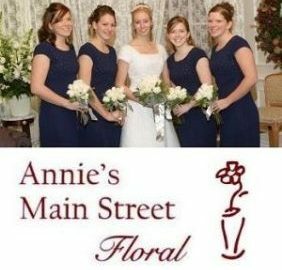 Get A FREE Brochure from "Annie’s Main Street Floral"
Please mention Salt Lake Bride when you contact Annie! I decided to go with Annie's Main Street Floral for my wedding flowers after contacting almost every flower shop in the slc valley and they wanted to charge me 250+ for just my bouquet. Annie was very helpful by making sure I would receive my ideal flowers within my budget. She gave me instructions on care and was very accommodating with payment and pick up. I was very nervous about seeing my bouquet at first as every other shop said there was no way I could receive my ideal bouquet for my budget however I was blown away when I received it. It was more beautiful and perfect than I can ever imagine. I had to arrange a family member to drive to Layton from the slc valley on the day of the wedding to pick them up however was totally worth it!!!! Thank you Annie for helping me having gorgeous flowers for my special day. I had Annie make my bouquets for my wedding. They turned out amazing! She was very easy to work with. I would recommend her to anyone who needs flowers for any occasions. I used Annie's for my daughter's wedding. It was a small event which included the bridal bouquet, 2 bridesmaid's bouquets, and 3 boutineers. The owner, Annie was very accommodating and worked with the photos I had to create beautiful arrangements!!! We were very pleased and I will send all my business to this florist in the future.